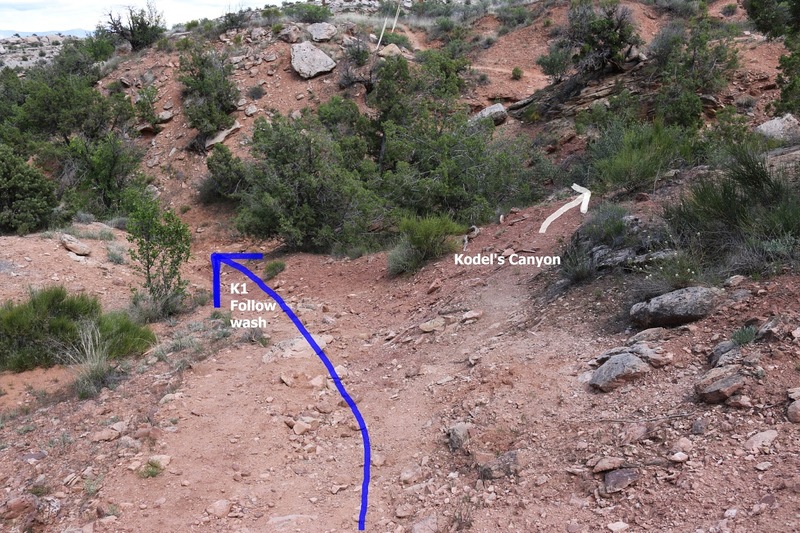 The K1 trail is located in the Kodel's Canyon Area of the McInnis Canyon National Conservation Area near Grand Junction and Fruita, Colorado. 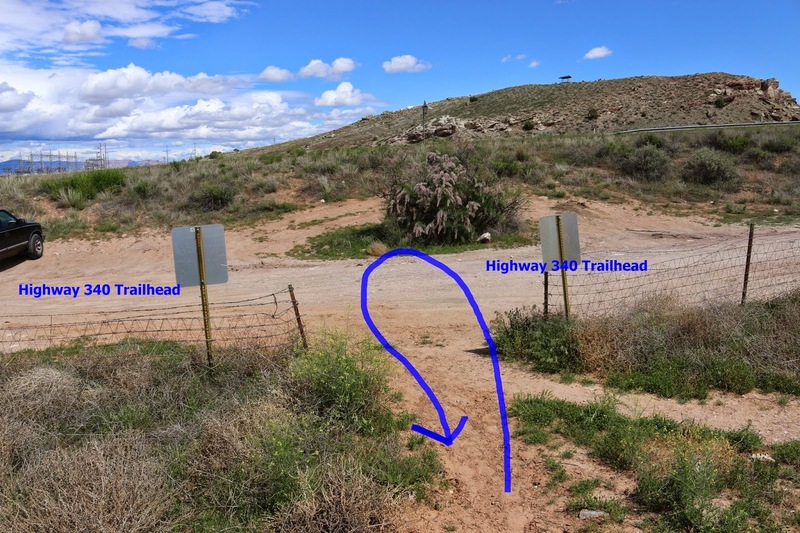 The 2.2 mile long trail takes a scenic route that partially follows the Old Ute Indian trail that skirts the mountain side along a secluded passageway behind the sandstone cliffs. 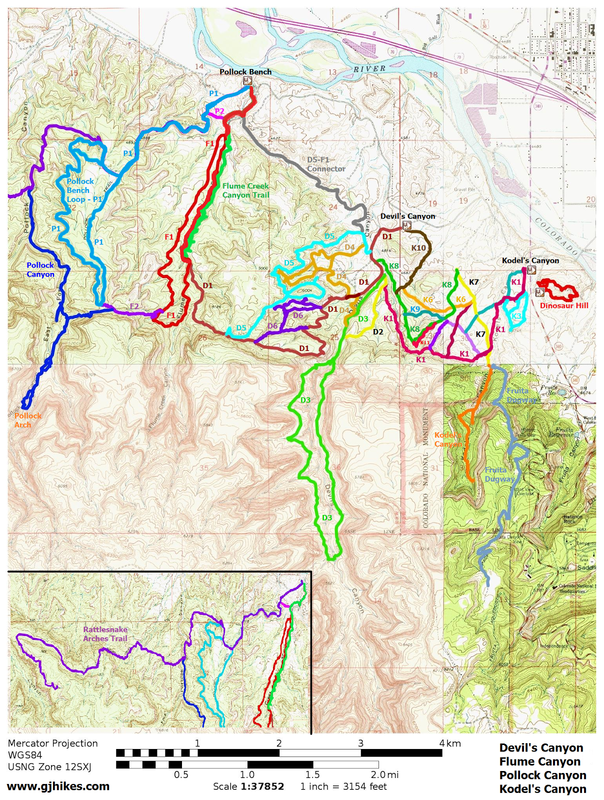 The west end of the trail begins off of the Devil's Canyon D2 trail and stretches all the way to the Kodel's Canyon trailhead along Highway 340. 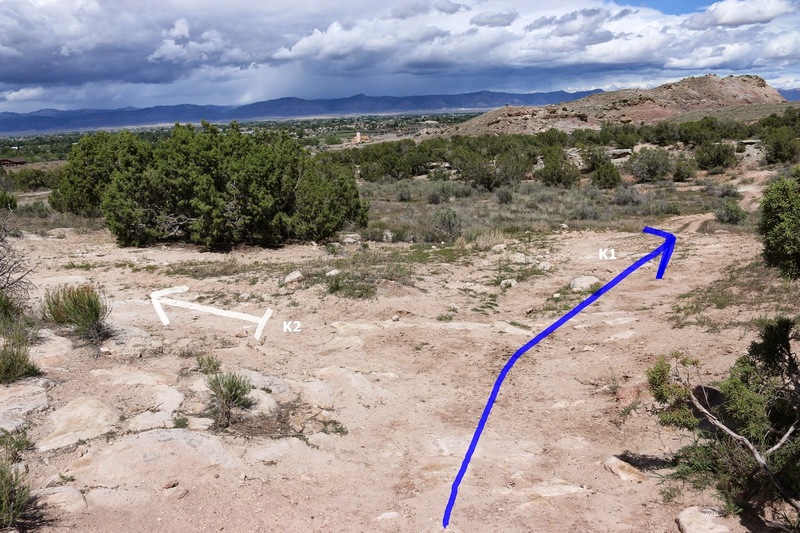 The round trip distance for the K1 trail by itself is 4.4 miles. Adding the distance to and from the Devil's Canyon trailhead makes it come out to 5.8 miles. 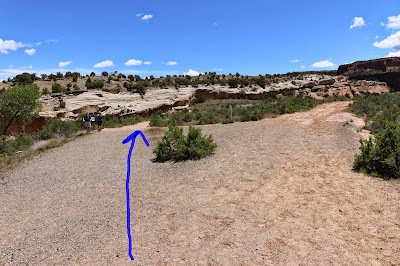 For this post we begin at the Devil's Canyon trailhead and hiked from there to the Kodel's Canyon trailhead and back again. 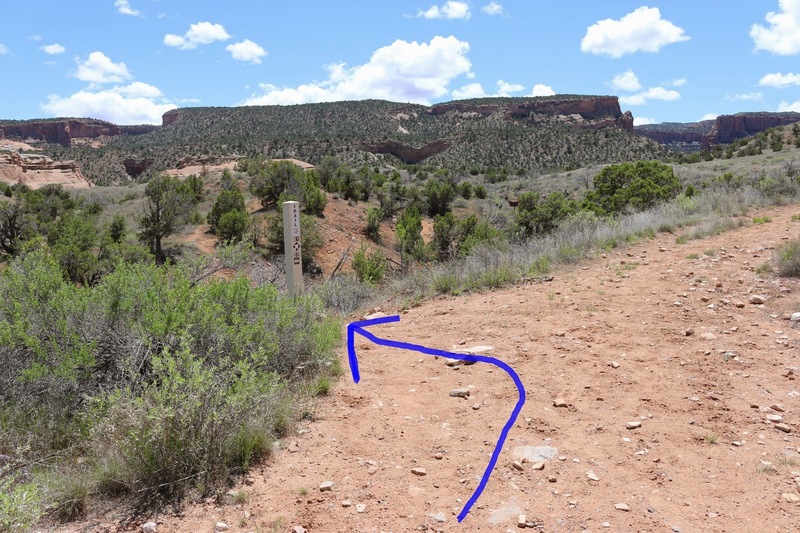 Follow the D1 trail as it leaves the Devil's Canyon parking area. At the half mile point take the left fork that is marked for the D2/D3/K1 trails. Stay on the D2 trail as it passes the point where the D3 trail departs after crossing the bridge over the wash and watch for the beginning of the K1 on the east side of the trail. The K1 trail climbs in, out and around several small washes as it parallels the scenic pink and white sandstone cliffs. As the trail nears the end of the line of cliffs it begins climbing to get to the behind the rocks area of the Old Ute Indian trail. The trail passes through an old fence line as it crests the ridge where the behind the rocks area is laid out before you. In the distance, beyond the city of Grand Junction, the Grand Mesa fills the skyline with the Little Book Cliffs trailing off on the left. Scenes like this make it a little easier to briefly escape from all of your other worries and concerns and enjoy the peace of the moment. As the trail travels behind the rocks it makes a steep descent down a loose slope and near the 0.9 mile point from the beginning of the K1 trail it is met by the K12 trail. After passing by the K12 junction there is another hump to climb over. A section of slickrock near the top is probably the steepest part of the climb but this hump is a lot shorter than the last one. The descending side of the last hump is mostly an easy dirt trail. Just past the 1 mile point the K5 trail connects up with the K1. After the K5 junction the K1 continues behind the rocks and at the 1.27 mile point it comes to an unmarked fork. Be sure to stay to the left at this point and follow the presently unmarked K1 trail into the wash.
At the 1.39 mile point the K4 trail drops into the wash where it comes to an end. 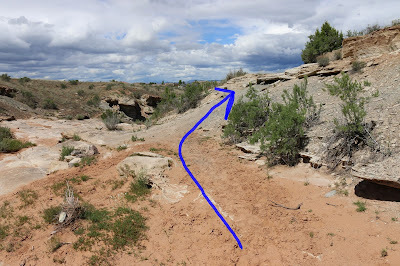 Shortly past the K4 trail junction there is a small rock shelter on the left side of the wash. Remember that it is illegal to dig or disturb in any way an archaeological site. Just before the 1.5 mile point the K1 trail intersects the K7 trail. The K1 gets a little confusing at this point. Follow the K7 to the left, north, and look for an unmarked trail that branches off on the right side of the K7 after only 10-20 yards. The next stretch of the K1 trail is down the wash that drains Kodel's Canyon. At the 1.84 mile point the K1 trail leaves the wash and begins climbing up a small bench. The K1 shares this stretch of the trail with the K2 trail. 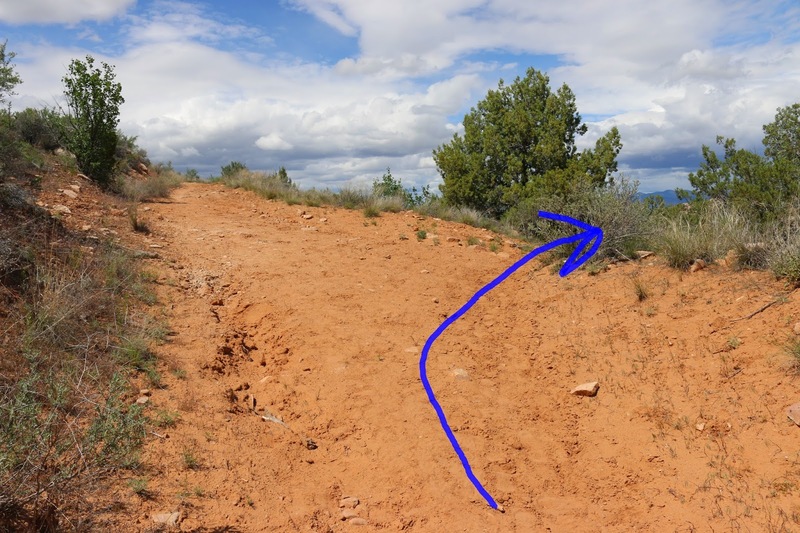 Once the trail gets to the top of the little hill there is another unmarked intersection. At this point the K1 trail continues straight ahead and the K2 trail forks off on the left. It can also be said that from here 'all roads lead to Rome' because both trails meet up again right before getting to the trailhead. 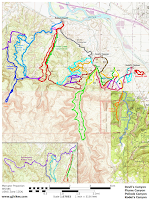 The K1 trail is intersected twice by the K3 trail as it heads toward the Kodel's Canyon trailhead along Highway 340. The Kodel's Canyon trailhead lies in the barditch of the highway. Across the road is the Dinosaur Hill site where there is a restroom if needed. For this post we turned around at this point and retraced the route back to the Devil's Canyon trailhead. The K1 trail is probably the hardest of the Kodel's Canyon trails but the beautiful scenery makes it well worth the effort. If you would like to see it for yourself then all you have to do is 'Take a hike'.